Players these days get a huge amount of stick for diving, and throwing themselves to the ground to con the refs – and quite rightly too. However, it turns out the fans are just as bad as the pros for diving, and an amazing new clip has been revealed which shows a Brazilian football fan pulling off the most hilarious dive loaded has ever seen. 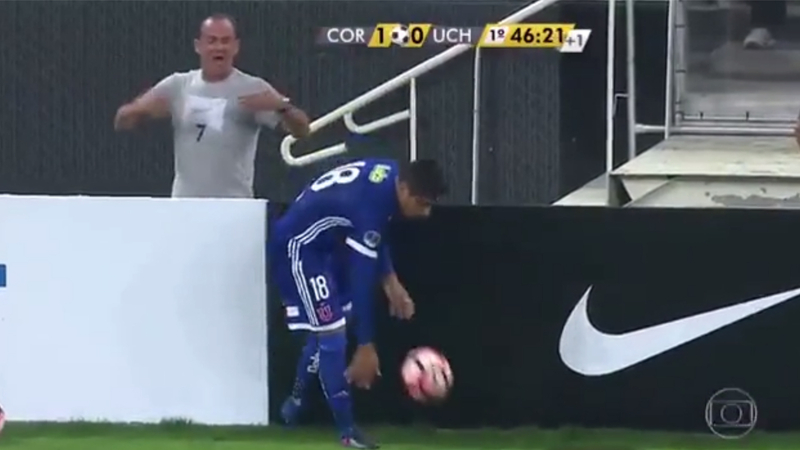 There was an amazing moment during Corinthians’ 2-0 win over Universidad de Chile recently, after a fan picked up the ball after it went out for a throw. The bloke refused to hand the ball back to an opposition player and he was half-heartedly pushed as a result. The guy first appeals to the ref, before dropping to his knees like he’d been shot. His performance is almost oscar-worthy, but no-one seemed that bothered by his antics, and the game carried on regardless. It’s one of the best things we’ve seen during a football game, and it rivals – or maybe even betters – Rivaldo’s dive at the 2002 World Cup. So, while it’s true that modern football has a real problem with diving, we never thought we’d see the fans getting involved in it too.